Wonderful Halos: Perfect for SNACKING & CRAFTING! Looking for the perfect HEALTHY snack for you and your family? 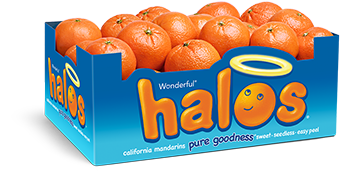 Look no further as Wonderful Halos are the perfect portable Non-GMO snack! Sweet, juicy, seedless and easy-to-peel these Mandarin oranges are packed with Vitamin C and are under 40 Calories a piece! Halos are grown in California and are in season from November through April, which means that you will find them in stores across the country at that time. Halos are the perfect snack to bring along to sports games, travel, work, school and more. In addition to being a great snack, Wonderful Halos are great for cooking and crafting! Wonderful Halos are perfect to complement a meal or to use as a main cooking ingredient. Our favorite recipes are Halos Island Breeze Smoothie and ​Halos Toast! For more delicious recipes check out the Halos Blog. Halos undeniably taste delicious but did you know that they also are great for crafting? Perfect for family time, Halos can be crafted into animals or even flowers! Our favorite crafts include creating the Halos Chick and the Halos Bunny! For additional crafting projects check out the Halos Blog! Wonderful Halos make a great low calorie snack between meals and is perfect for on-the-go! Wonderful Halos are perfect to complement a meal or to use as a main cooking ingredient. Our favorite recipes are Halos Toast and Halos Island Breeze Smoothie! Perfect for family time, Halos can be crafted into animals or even flowers! Our favorite crafts include creating the Halos Bunny and the Halos Chick!